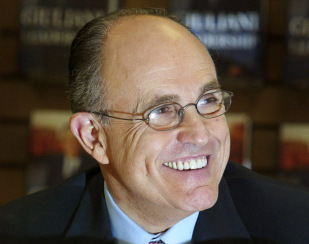 Rudy Giuliani might not be your favorite candidate, but he is an impressive, likeable,�and engaging communicator. Watch.�It is quite amazing that the Repubs have such a deep bench. Lots of folks I'd happily vote for, and no-one is ever perfect. Rudy is not my candidate, but I'd vote for him without complaint. Black-on-white crime just doesn't fit the narrative. LaShawn. More from Cramer. Another grim milestone. Dust my Broom. The ongoing lying of the pols about illegal immigration proposals. Rick at�RWNH. But Kesler is not quite so negative about it. The Hollywood blacklists. Mark Steyn via Driscoll.�Probably like you, I was taught that the blacklists were one more reason that America was a bad country. Wrong. These guys were traitorous, hated America, and allied themselves with Russia via�the Communist Party. Nothing was wrong with pointing that out. Sheesh. Al, check in with your doctor, and check your porphyrin levels. It looks like a set-up for a�lawsuit�to me. Protein.�To what extent should religious accommodations be made in schools and�the workplace? No more blunts. Vaporizers are the thing, dude.�Like healthy, man. Behind the DC gun lawsuit. Alphecca. Bird Dog, Giuliani may be an engaging speaker but I wouldn't trust him as far as I could throw him. If you support the second amendment and want to hold onto your firearms I suggest you look up Rudy's record on this subject and provide your support to someone more deserving. Is this post just a test to see if we are paying attention? I didnt say he was my candidate, Ted. Gun freedom matters a lot to me, as does abortion. However, these are not really issues that a President deals with - other than in Supreme appts. I am voting for Ron Paul. He is the only true Conservative out there. If he does not get the nomination I will not be voting. I can no longer hold my nose as when I vote for some Republicrat candidate.